President Donald Trump has nominated Susan Gordon, deputy director of the National Geospatial Intelligence Agency and a 25-year CIA veteran, to serve as principal deputy director at the Office of the Director of National Intelligence. The White House announced Thursday it has sent her nomination to the Senate for consideration. 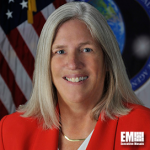 Before she joined NGA in 2015, Gordon concurrently served as director of the CIA’s Information Operations Center and senior cyber adviser to the CIA director. Gordon began her CIA career in 1980 as an analyst within intelligence directorate’s office of scientific and weapons research and later she took on engineering development roles within the science and technology directorate. She also previously led the creation of the spy agency’s venture capital arm In-Q-Tel and was the intelligence community’s focal point for biological research, development and engineering programs for collection and operations.